VVS Laxman (143) and Mahendra Singh Dhoni (132) slammed sparkling unbeaten centuries to compound South Africa's misery as India took a stranglehold of the second and final cricket Test with a mammoth 347-run first innings lead here today. Laxman notched up his 15th Test ton while Dhoni recorded his fourth as the hosts piled up a monumental 643 for six, their highest total against South Africa, before declaring their first innings about half an hour before close of play on the third day. 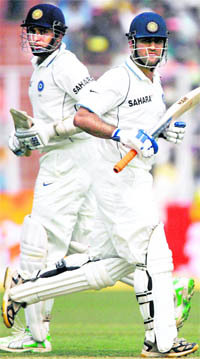 The last time four Indian batsmen got centuries in the same innings in a Test match was in Bangladesh in 2007. Not many outside the sub-continent give much credence to runs scored, especially against that attack, but here at the Eden Gardens the Indians were confronted by an attack that has the world’s number one bowler plus some who have given the world’s best a hard time. India’s top shuttler Saina Nehwal will skip the prestigious Swiss Open Super Series Badminton Championship slated to be held in Basel from March 16 to 21 as she wants to focus on the Commonwealth games and the All-England Championship. Even a century by Dhruv Mahajan was not enough to give his team its first win of the tournament, as Himachal Pradesh, with their tail up after a win over Delhi, convincingly defeated Jammu and Kashmir by six wickets and more than 11 overs to spare in the North Zone league match of the Vijay Hazare Trophy played at Shah Satnamji Cricket Academy Grounds here today. Various Indian-Canadian Associations and Canadian media have been overtly “sarcastic” while referring to the plight of three-member Indian contingent that reportedly reached Vancouver for participation in the Winter Olympics without money and ceremonial kit, including track suits and shoes. The Government has spent nearly Rs 60 lakh for the eight-member Indian contingent (three athletes and five officials) for the Winter Olympics at Vanocuver. “The Government of India has provided all possible funding for the training and participation of the Indian athletes for the Winter Olympics", the Ministry of Youth Affairs and Sports said here today. Indian Premier League authorities today allotted two of Deccan Chargers' home matches to their catchment area Cuttack to placate the franchise which had threatened to boycott the event after their home matches were shifted out of Andhra Pradesh because of political turmoil. Most television channels in the country today decided not to cover the third edition of the Indian Premier League in protest against the "arbitrary" guidelines and certain contentious clauses regarding footage of the Twenty20 event. The visitors got to face just five balls and were six for no loss before bad light forced play to be stopped early on a day completely dominated by the home team. Laxman and Dhoni gave a fine exhibition of strokeplay as they stitched a record 259-run partnership for the seventh wicket to put India in a commanding position from where they can push for a series-levelling victory. Fall of wickets: 1/73 2/82 3/331 4/335 5/336 6/384. Bowling: Steyn 30-5-115-1, M Morkel 26-3-115-2, Parnell 20-1-103-0, Kallis 12-1-40-0, Harris 50-5-182-1, Duminy 15-0-73-1. It was a measure of the splendid manner in which the Indians batted and dominated the bowlers. There was a mix of the orthodox and the unorthodox in the batting. It was quite fascinating when the Sehwag-Tendulkar partnership was blossoming to see how both kept the bowlers on the backfoot, so to speak. Sehwag attacked at every opportunity while Tendulkar was patient. If Sehwag was cutting the bowlers to shreds, Tendulkar was slicing them away bit by bit, yet causing the same immense pain. If one was playing loud rock music the other was playing soft romantic tunes. If one was playing by the book, the other was writing his own book. This is what makes Test cricket so special. 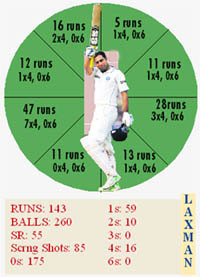 There are different ways to score unlike in limited overs cricket where there is hardly any subtlety about the batting. If Tendulkar used the lap shot to score off the left-hand over the wicket leg stump line, then Sehwag used the same lap shot in reverse to show that he could also play the gentle shot. It wasn’t very different when Laxman and Dhoni got together, though in recent times, the Indian skipper has kept the big shots in reserve till the declaration is on. What is good length for others is the length for Laxman to play the expansive drive through the off-side or the imperious flick through midwicket. It was heady stuff and the Eden Gardens crowd must have felt they were in heaven. How much India missed the presence of Dravid and Laxman in Nagpur could be seen by that massive partnership between him and Dhoni. It is not simply knowing how to build an innings and go on to a century, but it is also being aware of what the man at the other end feels comfortable about. Laxman has had many such partnerships mainly with Dravid whose solidity gives him the freedom to splash the 1,000 rupee notes around knowing that Dravid is keeping an eye on the small change and so his splurging will only enrich and empower the team. With Dhoni he knows he will have to run a bit harder since the Indian skipper is the fastest between 22 yards and also be ready to take the quick ones and twos. Speaking to The Tribune from Hyderabad, where she is undergoing training from Pullela Gopichand, Saina said, “I have my schedule charted out by my coach Gopichand and fitness experts. It will really be taxing on my mind and body to play in the Swiss Open. Moreover, I have to maintain a high fitness level for the Commonwealth games where I expect tough competitions from some European nations. “I also have to focus on the Yonex All-England Championship, which is commencing in Birmingham from March 9 to 14. On February 21, I have to go for the Uber Cup in Thailand. The calendar is a packed one for me and I feel, I should give the Swiss Open a miss this time”. The young shuttler has also set her sights on the Asian Championship, scheduled from April 12 to 18, at the Siri Fort Indoor stadium, New Delhi. Saina said her preparations for the prestigious All-England Championship were on the right track. “After Prakash Padukone, it is my coach Pullela Gopichand who won the championship in 2001. One day I will follow his footsteps and make him proud,” she added. Saina scripted history on June 21, 2009 by becoming the first Indian to win a Super Series Tournament, by clinching the Indonesian Open with a stunning victory over higher-ranked Chinese Lin Wang in Jakarta. Himachal skipper Paras Dogra won the toss and invited Jammu and Kashmir to bat first. The move paid off as Jammu and Kashmir lost four wickets in quick succession. However, Parvez Rasool (59) and Dhruv Mahajan (127) came to the rescue of their team and when Dhruv departed as the last batsman in the final over, Jammu and Kashmir had put 255 on the board. Himachal Pradesh needed to score at 5.11 runs per over and they batted briskly, surpassing the Jammu and Kashmir total in the 38.1 over loosing only four wickets in the process. Despite early loss of opener Sangram Singh, the other opener Hemant Dogra batted solidly and contributed 64 with six fours. 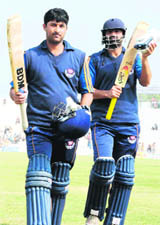 Mukesh Sharma (96 off 89 balls studded with 9 fours and 2 sixes) missed his century as he was run out in the 37th over. The best innings came from the Himachal skipped Paras Dogra, who scored unbeaten 60 off 45 balls studded with 4 fours and 4 sixes. Himachal will play Punjab in the last league match to be played in this ground on February 18. The Indian team comprising ski athletes Tashi Lundup and Jamyang Namgyal and Luger Shiva Keshavan reached Vancouver last week in time for the opening ceremony of the games. Shiva Keshavan went to Vancouver directly from a training camp in Germany and it is his fourth Olympics. One newspaper report said that in less than eight months, India will play host to the Commonwealth Games where athletes from British Columbia and Canada will also participate indirectly hinting that it will spend several millions on the home event but could not fund its national contingent for participation in Winter Olympics. Kulwinder Kular and Surinder Chahal, working for TV Channel Omni, told The Tribune over the telephone that on arrival, the Indian contingent spoke to media that they have no money and track suits to participate and begged money from the people of Indian Origin, who had come to receive them at the airport. Owner of an Indian community radio station said in a TV bite said she is hosting fund raising dinner for the ‘poor’ Indians. One sports storeowner ‘donated’ tracksuits to the team members expressing surprise that a country of textiles could neither afford nor give proper uniform to its athletes. Indian athletes had complained that uniforms given to them were mismatch and substandard. The fund raising dinner was ridiculed in the mainstream media next day. Canada’s leading daily, the Globe and Mail, said in a report that more than $8000 raised for the delegation at the dinner would be used for new equipment, future training and spending money by the members of the Indian team during their stay in Vancouver. Another newspaper report said with over a billion people in India, it is a disgraceful situation as India can launch satellites and space programmes, it can be a source for amazing hi-tech companies but it cannot adequately support its young athletes like those competing here in Vancouver for the 2010 Winter Olympic games. It said the expenditure included Rs 20,000 per person for the ceremonial dress and heavy clothing, differential of air passage cost - the organisers are paying flat Canadian dollar 1046 per person for the airfare while the ticket cost is around Rs 67,000 and the Government is paying the differential of around Rs 22,000 person--and out of pocket allowance of US$ 50 per person per day for three athletes and four coaches. The Government also spent Rs 15 lakh each for the training of Jamyang Nangial and Tashi Lundup and Rs 22 lakh on Shiva Keshavan. After a series of discussion and "at the request of the Deccan Chargers franchise to host matches in their catchment area", two matches have been scheduled in Cuttack. According to the revised schedule, defending champion Deccan Chargers will play Kings XI Punjab in Cuttack on March 19 and Delhi Daredevils two days later at the same venue. The News Broadcasters Association, which has 34 channels as its members, said in a statement that the IPL authorities and the official broadcaster of the event, in their meeting today, "arbitrarily" refused to abide by the 2008 norms which was endorsed by NBA. "In view of this position unilaterally taken by IPL/SET MAX, members of the NBA are unable to offer to their viewers any coverage in relation to IPL or its proposed matches," the NBA said.